Le moment où vous franchissez la porte d'entrée, vous tomberez en amour avec cette casa mexicaine moderne. L'intérieur a des couleurs vives chaudes avec peinte à la main carreaux Talavera partout. La chambre de maître avec un lit king, se ouvre sur un patio et la clé d'une petite piscine en forme. Il a sa propre salle de bain privée et la possibilité d'utiliser la climatisation dans la suite principale. (il y a un supplément pour le courant alternatif) La maison a son propre Wifi, un téléviseur à écran plat intelligent avec un sondeur Bose. Le jardin sur le toit est plein de plantes tropicales et d'un toit de palapa couvre une superficie pour manger et somnoler dans un hamac .. Il ya une vue sur l'océan et une brise fraîche qui apaise l'âme. La location comprend une femme de ménage deux fois par semaine, la livraison de l'eau disponible, fruits et légumes camion deux fois par semaine. Grande piscine commune et barbecue. La plage la plus proche, Playa Manzanillio, est à cinq minutes à pied de la maison. Il ya plusieurs plages à proximité. .Centrally Situé, à distance de marche de la Rinconada, l'Adoquin, Zicatella et SuperChe. Cette zone est bien connu comme un havre de paix et à l'abri des bruits de la nuit urbaine de Mexico. Si les clients veulent notre femme de ménage à faire leur lavage ou cuisiner pour eux, ils doivent négocier un prix pour ce en dehors du loyer. The home completely lived up to its photos in Home Away. Charming, quiet, the kitchen was adequately equipped for our cooking needs. I loved the plunge pool at night, lights off looking up at the stars. Patricia was very helpful and upon our arrival she drove us to the big grocery store " Chedraui". It has everything you will every need including a good wine selection and beer. The people in the complex are lovely and everyone was very helpful with suggestions of where to go and what to eat. Beaches we enjoyed = Carrizallilo and YES its definitely 150 steps down and 150 steps back up. Not a lot of shade but great swimming beach. The Rinconada street (15 minute walk) offers all sorts of restaurant choices from Italian, bakeries, Mexican, fish and more. Our favorite was Turtle Bay ( fabulous Fish). We also loved walking Zicatella Beach. its approx a 3Km walk with dramatic surf (definitely no swimming) and fun to watch the surfers. We walked it in the morning as it was too hot mid day. Only negatives which are both fixable were the washing machine wasn't working and the fan in the front smaller bedroom didn't work. Patricia kindly offered to have our clothes washed outside and brought back but we managed with hand washing and the clothes line was great for drying everything quickly. Perfect location between the best lounging/swimming beach and the Adoquin. It's a short walk to both. Well equipped, 2 great pools, beautiful rooftop palapa with views, nice neighbors in the complex. We paid to use ac in the master bedroom but there are only fans in the other areas. Some of our guests were too hot to sleep well at night.. Also a short taxi ride from the beautiful surfing/swimming beach of Carrizalillo. We spent most of our two weeks there and at La Palapa de Carrasco down the stairs at the end of the block at Playa Manzanillo where the owners treated us like family. They prepared delicious food and drinks and made sure we were comfortable. The only negative was finding the place when we first arrived. There is a street address so make sure you have that ready for the taxi driver as ours did not know the complex name. Most other taxis did however. The home is as described and the good reviews are very accurate. It is nicely furnished in a clean and safe gated community. However, the best part was working with lois and her staff on final arrangements. She was very responsive and helpful. Her local staff (Pati) helped arrange a cook and the menu for a special dinner night. It was a highlight of our stay. On our next visit to PE, we would love to stay again if available. Wonderful home that was perfect for our family! Felt like being home. A private oasis to return to at the end of a busy. The home has everything a traveler requires. All you need to bring is your summer clothes and your toothbrush. Afternoons on the palapa were perfect for reading and gazing at the ocean. A quick dip in the plunge pool before bed cooled us off. The twice a week maid service was lovely. The home is spotless. Nice lush towels are provided. When we wanted company, we would visit the very nice neighbors at the shared pool. The home is within walking distance to everything including all the beaches. The owner and property manager were excellent to deal with. Definitely worth staying here. We enjoyed 2 wonderful weeks in this lovely home. The listing is accurate, and the house met all of our expectations. It is charming, clean and well maintained, with a fully equipped kitchen. We especially loved the rooftop terrace, the private plunge pool and the larger shared pool. 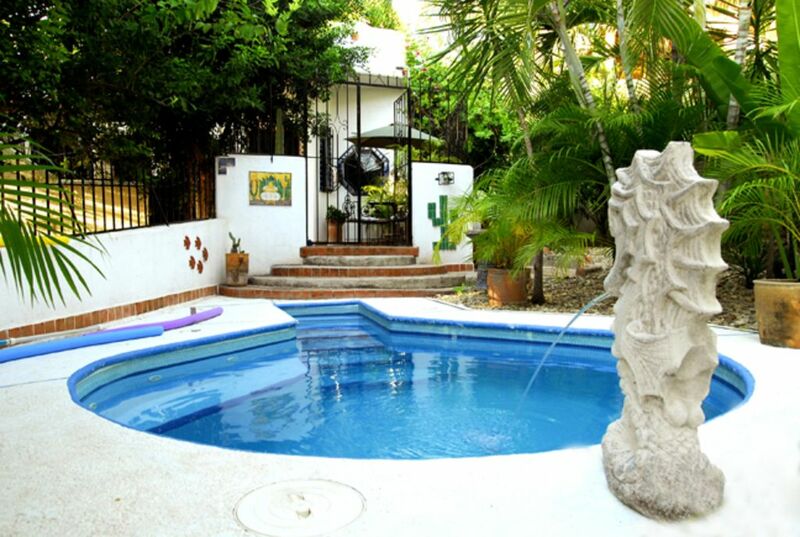 The house is in a very quiet location, and just a short walk to Playa Manzanillo. Lois, the owner, was very helpful and responded promptly to our requests. I will definitely return, and would recommend this casita to others.